Climate Lessons: Background Briefing for Teachers of Climate Studies: 10 Reasons why Man-Made Global Warming is Wrong. Background Briefing for Teachers of Climate Studies: 10 Reasons why Man-Made Global Warming is Wrong. Man-Made Global Warming WRONG - The Ten Reasons. 10 Reasons why Man-Made Global Warming is Wrong. 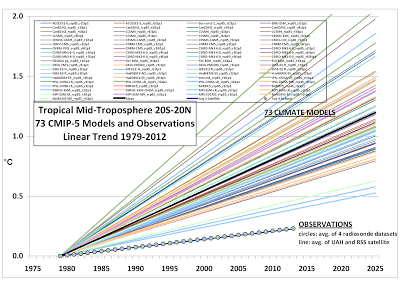 Some will say Roy’s comparison only shows the models can’t predict the Troposphere. 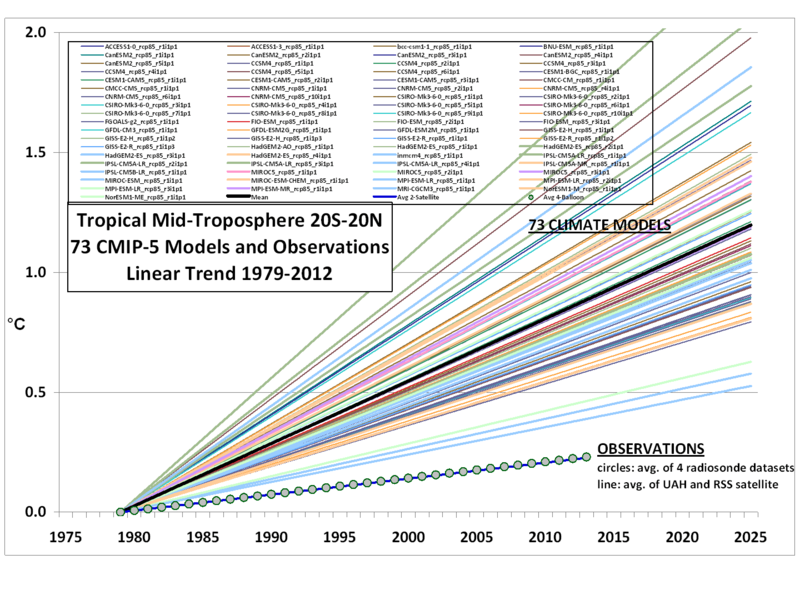 But as Bob Tisdale shows the models also can’t predict sea surface temperatures, land and sea surface temperatures, or precipitation. Nor can they, as Koutsoyiannis showed, predict the past. AGW science says the sun has little effect on temperature compared with CO2 forcing. Dr Ka-Kit Tung disagrees and has compared the long-term solar record with the longest temperature record on the planet, the Central England Temperature [CET]. The final image in Tung’s slide presentation is revealing and shows a remarkable correlation between the CET record and Total Solar Irradiation [TSI]. This correlation between temperature and TSI has also been derived in 2 other studies. 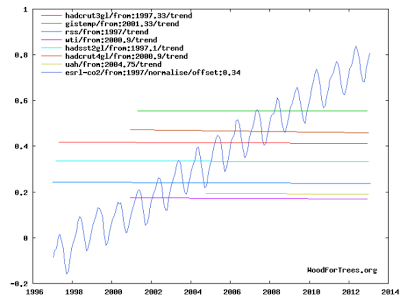 The first is by Glassman at Figure 1 where he uses global HADCRUT3 data. The second is by Stockwell at Figures 4-7 where all the major land-based temperature indices are shown to correlate with TSI using his model. Stockwell’s model is simply that temperature responds to TSI mean with the rate of temperature increase/decline determined by the movement away from the mean. A new study from Spain, the home of solar power and national bankruptcy, shows how variations in solar radiation correlate well with temperature without any need for AGW. The increase is due to cloud variation. Of course Monckton was on top of the role of clouds and temperature when he debated Tim Lambert - and Lambert sprung that infamous ambush about Pinker being a woman not a man. What was overlooked was the fact that Monckton was correct. Pinker et al had found that solar forcing through cloud variation was sufficient to explain all the temperature increase from the 1980’s onwards. This should come as no surprise really because it is exactly what the IPCC in TAR had found too. “In our simulations, we find that the reduced brightness of the Sun during the Maunder Minimum causes global average surface temperature changes of only a few tenths of a degree, in line with the small change in solar output. However, regional cooling over Europe and North America is 5-10 times larger due to a shift in atmospheric winds." In Tom Cruise’s latest movie, Oblivion, aliens conquer the Earth by destroying the Moon and creating climatic havoc. Ian Wilson is probably entitled to a script credit. Wilson and his co-author, Nikolay Sidorenkov’s latest paper looks at how the Lunar cycles have major impacts on the Earth’s climate. This is intuitive since the Moon has such a pronounced effect on the oceans; it is reasonable to suppose it has an equal effect on the atmosphere. Jo’s analysis reduces Wilson and Sidorenkov’s complex paper to a satisfying layman’s level. These minute particles can be part of volcanic eruptions and be produced by industrial processes. Their effect on climate is complex and suspected of causing both warming and cooling. Their most spectacular effect was on the Ozone layer which protects the Earth from the sun’s worst radiation. Now professor Qing-Bin Lu, former Newcastle university student has done a comprehensive analysis of the effect of aerosols on climate. This is a remarkable repudiation of AGW. Equally remarkable was the response of leading AGW scientist David Karoly when interviewed on the ABC. It was plain Karoly had not even read the paper. The significance of decreased pressure profoundly contradicts AGW; with decreased pressure there can be no THS, a vital prediction of AGW. 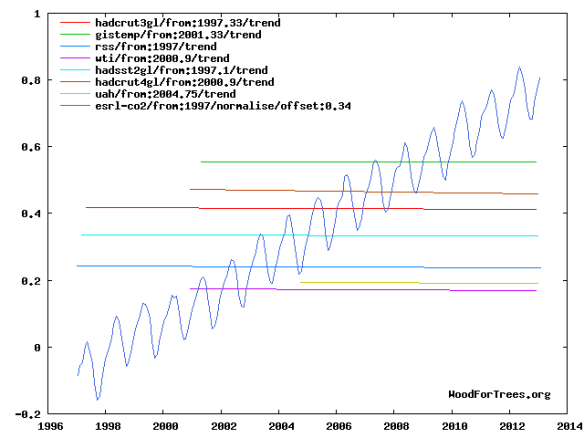 The pressure drop also confirms that even if AGW exists it is a minor player of no consequence. The Lacis paper on behalf of AGW wants us to believe the non-condensing greenhouse gases control the earth’s temperature and disaster will occur because of a 3.7 W/m2 forcing over the next 100 years or so. But this minute forcing is dwarfed by evaporating/condensing water which generates energy fluxes from Ldq and PdV [equations 1 to 3] that well exceed 1000 W/m2 each and every day. Small variations in those fluxes, such as cloud cover or levels of humidity make AGW forcing, if it is right, insignificant. The basic issue of whether humans are responsible for all the increase in atmospheric CO2 has been looked at before. If CO2 increase is not due to human emissions then it is irrelevant if the claimed effect of CO2 on climate is true or not. Professor Murray Salby has given a comprehensive presentation on why the increase in CO2 is most likely due to natural emissions. CO2 follows temperature and the sun has warmed the Earth from 1850 up to the end of the 20thC thus providing the temperature cause to a natural CO2 increase. Salby addresses the mass balance argument [MB] which supposedly proves the CO2 increase is due to human emissions because the increase in CO2 is less than the human emissions. The MB cannot be right because the highest concentrations of CO2 are in non-industrialised areas such as the Amazon, key elements of the MB such as natural sinks and emissions are unknown and the correlation between temperature [and therefore natural emissions] is very high while there is little correlation between CO2 increase and human emissions. These facts speak for themselves and should be front page news. They are not. That fact should also be front page news. This article has also be re-blogged at The Hockey Schtick. There are useful comments there, as well as on the original post by Cohenite at the No Carbon Tax Climate Skeptics Party of Australia blog. The first graphic above is shown more vividly at the C3 blog, along with more useful commentary, e.g. "Through a combination of yet barely identified and poorly understood earthly/solar/cosmic natural forces, via the newest research it is now becoming more appreciated by a growing legion of scientists that the climate responds in a non-linear and chaotic manner that simply overwhelms any CO2 trace gas influence during the short, medium and long-terms. The IPCC et al. alarmists religiously deny the dominance of natural climate forces yet continue to mindlessly blame CO2 despite all objective evidence that at best, it has a weak, minor role in the world of climate outcomes."